At the Interactive Aquarium Cancún, you will get to see certain marine reptiles up close such as sea turtles, red-eared slider turtles and crocodiles. Females are bigger than males, they can reach up to 30 centimeters long, they have two red patches on either side of their head, a characteristic particular to this specie. Males have a longer tail and longer nails on their front legs than females and their shell is slightly more sunken to make mating easier. They can live for up to 20 or 30 years. Diet: They are omnivorous, they eat vegetables and animals. Fun Fact: The turtles’ gender is determined by the temperature of the incubation period. 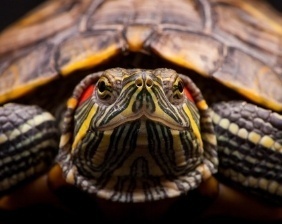 If the temperature was below 29ºC during incubation, all the turtles that are born will be male. If the temperature is above 29ºC, the turtles will be female. It is normally found in Guatemala, Belize and the Mexican Gulf in the states of Tamaulipas, Veracruz, Tabasco, Campeche, Yucatan and Quintana Roo. It is mostly found in fresh water swamps and also in inland swamps, in the great lakes and rivers. They can also be found along the coastal areas, in brackish waters and also in the savannahs covered with weeds in the Yucatan Peninsula. Juvenile crocodiles are bright yellow with some dark bands. The crocodile’s iris is silvery brown. They have a long tail, which is used for swimming. The hind feet of the crocodiles are webbed. They have four short legs, for this reason the crocodiles are always very near the land. They have very explosive capabilities because of their strong muscles and are fast runners. Diet: Carnivores, youngsters feed largely by fish and insects, and adults feed on small mammals, birds and even other reptiles. Size: Up to 3 mts long with a max of 4.3 mts. Did you know that? 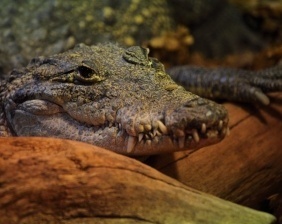 : Crocodiles have been known for being cannibals, this includes eating their newborns. Over 140 species on display in the only Aquarium in Cancun. Enjoy the magical experience of the aquatic world with your family.